An intuitive and easy to use software makes the user smile - a goal KDE strives for, especially with a look at KDE 4. At last year's aKademy, the KDE Human Computer Interaction Working Group has formed up to support the developers to achieve this goal. The mission was to improve the KDE desktop with regard to accessibility, arts and design, documentation, internationalisation, and usability. From this effort, a number of multidisciplinary activities have arisen which all serve the same goal: Developing a desktop that is compelling, usable, and understandable for people. In the center of a good part of these activities was the user-oriented design process. The idea is to develop software around how people can, want, and need to use their computer, rather than forcing them to work in a way that accommodates the system. It can be characterised as a multi-stage problem solving process: Starting with an analysis of the functionality users actually require, it proceeds with designing interfaces that support the way users are likely to use the software. In an iterative process, and in close collaboration with the developers, those preliminary designs are then stepwise improved and evaluated in real world scenarios with actual users. During the last year, methods of a user-oriented design process have been successfully applied to various KDE projects, including Kuroo, Kivio, the Oxygen icon set, KDE accessibility tools or Kubuntu. As well, the Human Interface Guidelines for KDE 4 have been designed in a user-oriented process, comforting the needs of their users: the KDE developers. The applied methods in the different projects were widespread, ranging from user interface inspections along paper prototypes, online surveys, card sorting or personas to usability testing. Along the above examples, the benefits, as well as the methodology and functionality of a user-oriented design process will be shown up. Developers will learn when and how their paths should cross the HCI working group to design a software that meets the needs of their users. Ellen is a psychologist who specialised in Human-Computer Interaction. 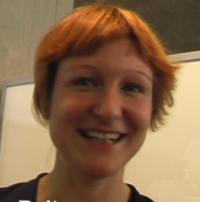 As a usability engineer from OpenUsability.org, she got involved with KDE in 2004. Since then she has been helping to design interfaces for several KDE applications, and is working towards an improved overall usability of the KDE desktop by introducing methods of a user-oriented development process. In the scope of the Human Computer Interaction workgroup she is promoting a closer collaboration of accessibility, design, documentation, internationalisation, usability and development.